Aside from its exceptional beauty, North Island has long been renowned for its fertility and also for the richness of the fishing grounds wherein it nestles. It is not surprising that North Island draws upon these exceptional natural resources to offer you a truly unique dining experience. 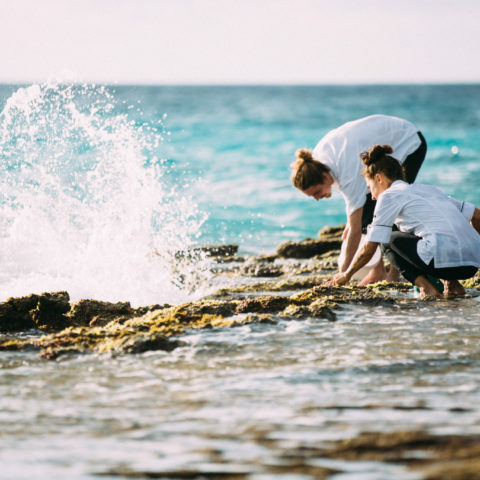 Our chefs are passionate about Island foraging and get out of the kitchen on a daily basis to gather the freshest organic and sustainable produce to inspire your menu suggestions. 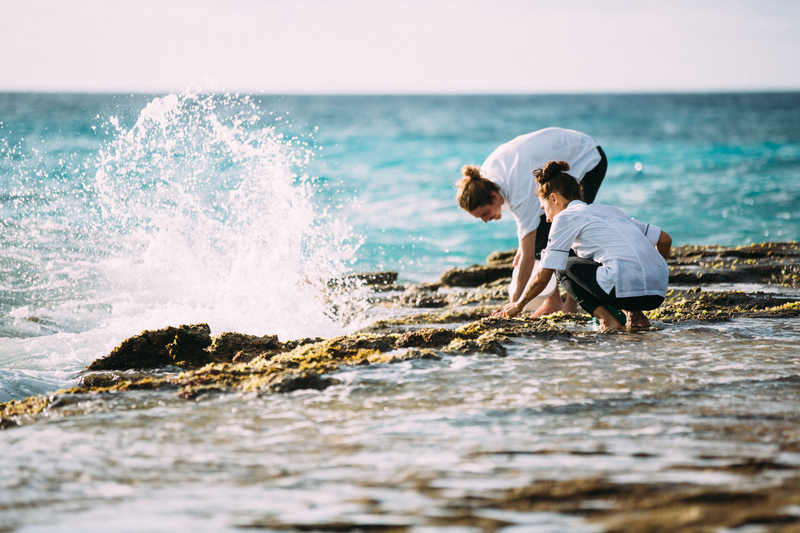 North Island’s cuisine is deeply connected to the spirit of the Island and our food philosophy is rooted in fresh, seasonal and relevant produce. It draws on the unique flavours of Seychelles and the culinary heritage of its people. The emphasis on freshness (of approach and of ingredients) is integral to the creation of each day’s menu. Our chef designs menu suggestions on a daily basis according to the latest harvest and in consultation with the guests and their requirements, resulting in a truly bespoke, creative and flavourful menu that is consistently varied. Our chefs make use of the organic vegetable gardens on the Island and forage for wild tropical fruits in the lush forests. You can expect to see luscious ingredients such as bananas, green papaya, mangoes, local oranges, bigarade, tamarind, starfruit, passionfruit, chilies and a few local delicacies like palm heart, breadfruit, germinated coconut and bilimbi. Our vegetable garden is in full bloom with loads of leafy options and our herb gardens are filled with variants of basil, parsley, dill, chives, lemongrass and edible flowers. We also make use of many other exotic spices that are grown in the Seychelles such as vanilla, cinnamon and nutmeg. The fish served on the Island is caught straight from North Island’s waters by the chefs themselves and the Island has strict fishing policies to ensure that all fish is caught sustainably. 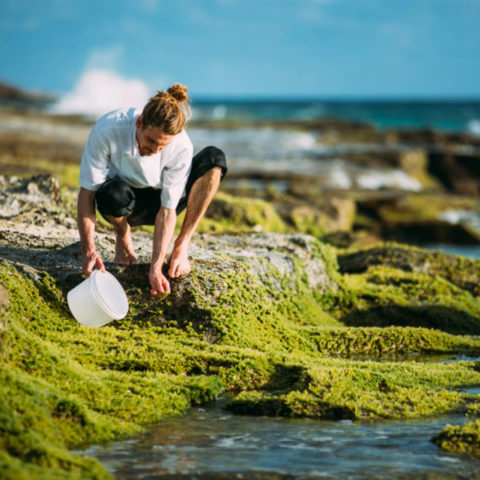 At low tide, you can find our chefs at West Beach in their chef’s whites harvesting the freshest seaweed from the exposed rocks – perfect for adding texture to salads, sushi and raw food dishes, or for flavouring Asian-style broths. They’ll also be sure to scoop up a pot of fresh sea water in which to cook your pasta, to impart that genuine flavour of the sea into your seafood pasta. The Kitchen brought in a fermentation specialist who has started making classic natural ferments such as dosa, kimchi, sauerkraut, miso and kombucha, whilst training the team. We have also started sprouting lentils, beans and seeds and activating all our nuts before use. These techniques not only enhance their flavour and freshness but also allow our bodies to better digest them. These nutrient rich foods, full of enzymes and probiotics, lend themselves to the healthy holistic lifestyle on North Island, where the experience is centred around wellness and wellbeing. While the cuisine on North is based on the diversity of the flavours of the Island and cultural influences which make up the Seychellois Créole flavour, the food concept on North Island has grown to become one of a more global offering, catering for each and every taste. Watch our video on the Flavours of the Island to learn more about dining on North. You can also get some of our famous North Island recipes here.